0x is one seriously ambitious project. It’s primarily developing a protocol to enable decentralized trading of tokens on Ethereum. It has the potential to become the technical standard delivering seamless interoperability of tokenized value across platforms, geographies, and individuals. In essence, 0x offers a decentralized exchange plugin for Ethereum-based (d)applications. Once the 0x Protocol has been integrated into a dapp, the dapp has a decentralized exchange function and the dapp’s native token can be easily traded against other ERC-20 tokens that have integrated the plugin and Ethereum. There is a growing list of Ethereum-based projects that have integrated the 0x Protocol into their dapp, including Maker, Augur, Request Network, Aragon and Dharma. The tokens of these dapps are thus directly tradable against each other. For example, you could convert your payment through the Request Network into Maker’s stable coin DAI directly through 0x. Due to several clever technical innovations, trading based on the 0x Protocol is much cheaper and faster than transactions on the Ethereum blockchain. Even though many key players in the blockchain space are emphasizing the importance of decentralized exchanges, the reality is that over 99% of all cryptocurrency transaction volumes still stem from centralized exchanges. The main reason for this is that centralized exchanges provide fiat gateways, are easy to use, have advanced trading tools and provide liquidity to traders, all of which have not been enabled by decentralized exchanges thus far. However, these are issues that can and are being resolved. On the other side, decentralized exchanges have multiple advantages over their centralized competitors in terms of security, as users fully control their own assets and therefore there are no tempting central wallets to hack. Moreover, decentralized exchanges allow for anonymity and in general, they make much more sense given the possibilities created by blockchain technology, such as no server downtime. Centralized exchanges feel like a step back but are still necessary for now as DEX technology isn’t quite there yet. However, it’s being built out at a swift pace, and the 0x Protocol is a vital piece of infrastructure that brings liquidity and security to decentralized exchanges, while significantly reducing the cost of using these trading platforms. To pay for transactions on the Ethereum blockchain, GAS is used. Due to current scalability constraints of the Ethereum network, the prices of transactions have been rising while the speed has been falling. This has led to several decentralized exchanges such as IDEX and EtherDelta becoming overly expensive, especially when one makes frequent trades because each transaction executes a smart contract, which costs GAS. To circumvent this, the 0x Protocol enables orders to be placed off-chain. Only actual value transfers are transmitted to the Ethereum blockchain. This is made possible by the relayers of the 0x Protocol. Relayers broadcast all of the placed orders through the 0x protocol to the entire 0x network of relayers to match buyers and sellers. Simply put, the relayers are nodes of the 0x decentralized exchange that facilitate the matching of buy and sell orders. 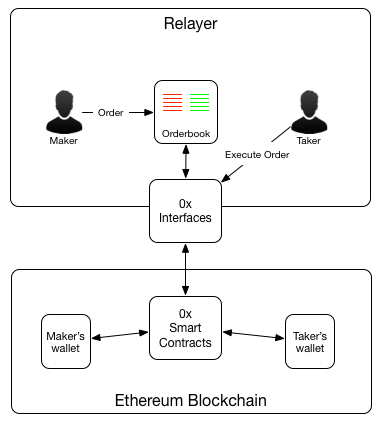 Relayers transmit orders to the 0x network by sharing a standard API. Once a sell order is filled, this match is broadcasted to and conducted on the Ethereum blockchain and the relayer receives a fee in ZRX tokens. The more relayers and dapps join the 0x network, the faster orders will be filled. A list of the current relayers of the 0x network can be found here. Its possible to launch a relayer in a few minutes using a simple, extensible 0x relayer codebase that can be forked or used as reference material to create your own marketplace. The 0x team wants to extend their protocol further and is working on Point-to-Point orders, which will enable parties to trade ERC20 tokens directly through any messaging system such as Whatsapp, Telegram or Reddit. A very nice trade widget has also been released, allowing instant token purchases in a single transaction. Besides paying relayers for successfully matched orders, the 0x token, ZRX, is used for the decentralized governance and development of the 0x protocol through a Proof-of-Stake consensus algorithm. ZRX holders can stake their token holdings on voting for improvement proposals of the 0x protocol. This governance system is interesting because as more dapps start integrating the 0x protocol, more projects become reliant on 0x and will want to have a say in its future development. There are currently plenty of debate over how useful the token is, and what its primary purpose should be. While users of various DEX’s can pay fees in ZRX, this is seen as an unnecessary friction point by others, who do not mandate that fees are payable in ZRX (eg. Paradex), and one DDEX has even gone so far as to fork the project and remove fees using a token entirely. The team has been working on version 2 of the 0x protocol, which launched in September, and brings further modularity and extensibility, allowing developers to address many new use cases, including for non-fungible tokens (ERC-721). Moreover, they will focus on improving the protocol’s UX and UI. Besides this, the team has indicated that they will be spending a lot of their time on rolling out their decentralized governance model, for which they have a separate roadmap. The 0x token sale ended on August 16th, 2017, during which the project managed to reach its hard cap of $24 million. The ICO price of ZRX was $0.048 a piece. In total, there are 1,000,000,000 ZRX tokens, of which 50% was sold during the ICO. 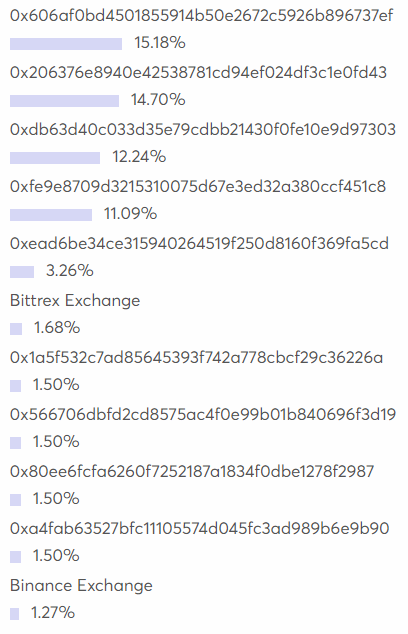 Top 20 Addresses hold 71% of the Supply. Co-founder and CEO: Will Warren. Previously a technical adviser for the Basic Attention Token project with a bachelors in mechanical engineering at UC San Diego. Co-founder and CTO: Amir Bandeali. Before founding 0x, Amir was a trader at several companies and he possesses a Bsc in finance from the University of Illinois. The founders are supported by a sizeable team, comprising 6 software engineers and 12 more members in charge of design, research, marketing, and operations. This team has an impressive advisory board, including the co-founder of Coinbase and the CIO of Pantera Capital. There is no direct competitor for the 0x Protocol as the project’s approach is unique, but also because it’s hard to compete with 0x by design. 0x can integrate existing ERC-20 decentralized exchanges into their network, which would turn these exchanges into liquidity pools for the 0x network, but this doesn’t go the other way round. The 0x team has also indicated that they’re open for collaboration with decentralized exchanges on other protocols, such Blocknet, Waves and Stellar DEXs. It’s no secret that big exchanges are working on decentralized solutions. Bitfinex has already released a hybrid DEX in Ethfinex, Binance has announced that they will launch their own decentralized exchanges in the nearish future, and Coinbase has purchased 0x relayer Paradex. This is actually great news for 0x, as Ethfinex uses the 0x protocol, and its certainly possible that Binance will also implement the protocol into their DEX. The more dapps that integrate the 0x protocol, the higher the liquidity of the decentralized exchange protocol becomes. This presents a great improvement over current decentralized exchanges, which face severe liquidity issues. A serious problem of low liquidity is that small buy and sell orders in terms of value can have a significant impact on the price of an asset. Decentralized exchanges for ERC-20 tokens such as IDEX and EtherDelta have been plagued by these liquidity issues and this hasn’t been solved thus far. The 0x protocol makes the exchange of ERC-20 tokens faster and cheaper, increases exchange liquidity while maintaining decentralization principles. 0x has been receiving a lot of support from other Ethereum-based projects, as indicated by the reputable dapps that have integrated the protocol, indicating that the problem they are trying to solve is real. However, especially in the wake of the DDEX fork, there is some criticism about the relevancy of the 0x token. It has been argued that the 0x token makes the protocol unnecessarily more difficult for newcomers and even that the token might be unnecessary in general. The fees for using 0x relayers can just as easily be denoted in the traded currency. It’s really rather bad UX to demand that users of DEXs pay fees in ZRX, as it adds another layer of complication. Its possible to use fee abstraction (atomically buy ZRX to use in fees) but again, this adds complications and will lead to worse prices for users. Certain relayers (Paradex, pre-fork DDEX) do not use ZRX for fees, and to some extent are piggybacking off the useful smart contracts and libraries 0x created for free. Both are taking fees using spreads and not ZRX. There is also the problem of liquidity, as there is hardly any. Of open orderbook relayers, only Radar Relayer has any significant liquidity, so the shared liquidity pool is basically just a way for other DApps to plug into Radar’s liquidity. The spreads on 0x / Radar are quite bad (~2% regularly for the biggest market ETH-DAI). This makes it hard to build any kind of serious trading app on 0x. A possible reason for the poor spreads is that canceling an order requires sending a slow and expensive on-chain tx. This is not an especially big deal when you’re just buying a small amount of tokens, but when you lose 1–2%+ on every single trade it’s hard to profit from any trading strategies. Non-immediate trade finality has also been highlighted as a problem. Once you submit an order in a transaction, it could fail if it the maker has cancelled the order in the time between settlement. This problem is exacerbated during times of volatility, as market makers cancel more frequently, resulting in frustration for traders who are drawn to the volatility. The good news is that these problems are all solvable, and the team has indicated it’s aware of them and is actively working on solutions. It’s still very early stage tech, so it’s unrealistic to expect a perfect solution for something as complicated as decentralized exchange of value. Despite reservations over the utility of the token, the team has also clearly emphasized the importance of their decentralized governance model for the protocol, in which the 0x token will play a key role (check out Ran Charag comment below the article for more info). Nonetheless, the necessity and added value of the 0x token still needs to be proven. The protocol can become the decentralized exchange backbone of the Ethereum blockchain network while keeping costs low and trades fast, effectively reducing the industry’s dependency on centralized exchanges. Every dapp that integrates the 0x protocol increases the value of the 0x network and the liquidity of the decentralized exchange protocol while heavily reducing the cost of conducting decentralized trades. What’s more, there’s a host of cool things just waiting to be built that can leverage 0x. Gaming and non-fungible tokens, decentralized marketplaces, compliance and infrastructure solutions can all be built on top of 0x. De-Fi (decentralized finance) is a buzzword you will hear more and more, and 0x is positioning as an integral element of this exciting new movement. Let me know what you think of ZRX in the comments?